Vinny Testaverde is a retired Quarterback who played for the New York Jets, Tampa Bay Buccaneers as well as the Carolina Panthers. Testaverde also previously played for the Cleveland Browns, the Baltimore Ravens, the Dallas Cowboys and the New England Patriots. Testaverde holds the NFL records having thrown a touchdown pass in 21 consecutive seasons and an interception in 19 consecutive seasons. In addition, Testaverde holds the NFL record for throwing touchdown passes to 70 different players. In 1986 he won the Heisman Trophy. Wayne Chrebet was a popular wide receiver for the New York Jets from 1995-2005. Chrebet, an undrafted free agent out of Hofstra, played for the Jets from 1995-2005 and finished his career as one of the top receivers in franchise history, ranking 2nd all-time with 580 career receptions and 5th with 7,365 yards from scrimmage. He also had the third-most receptions in NFL history among players who were not drafted. His jersey number hasn’t yet been retired but the Jets haven’t issued his number again since his retirement. Sports Speakers 360 is a booking agent for pro athletes. 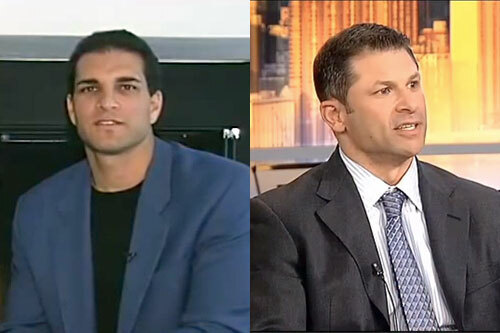 If you would like to book Vinny Testaverde or Wayne Chrebet for a speaking engagement, appearance or endorsement, contact a Vinny Testaverde or Wayne Chrebet booking agent for fees at 1.855.303.5450.